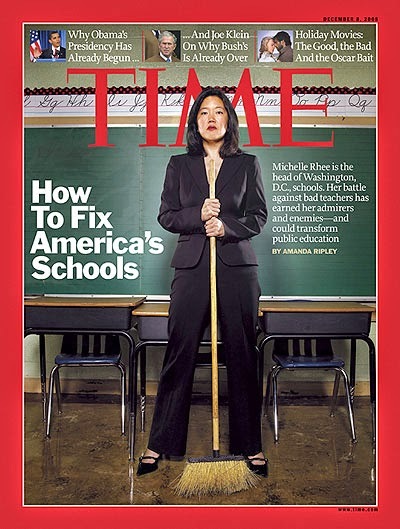 The big news of the week is the Time Magazine cover which states the falsehood that it’s (nearly) impossible to fire teachers who have “tenure” and the saviors of America’s children, rich tech entrepreneurs, have solved the problem. I haven’t read the article…I don’t subscribe to Time and haven’t for decades. I remember an argument my father and I had over Time. I said that Time was a tool of the dreaded Military Industrial Complex (this was the 60s, after all). His response was that they were an opinion magazine and if I didn’t agree with them, I should express my own opinion. Unfortunately, even back then Time had a lot more readers that I did. Time itself classifies itself as a “news” magazine and in that way disputes my father’s description of it as an opinion magazine. Dad was right, of course, and I would maintain that nearly all “news” sources are “opinion” sources, after all (see Fox News), but the fact remains that the magazine is ubiquitous for any American who sits in a dentist’s or doctor’s waiting room. Some of those who have read the recent Time article claim that the cover doesn’t accurately reflect the content of the article. In America, however, the soundbite, or in this case, the imagebite, rules. For most people, Time’s cover is all the content that will be seen. Time publishes different editions for different parts of the world. 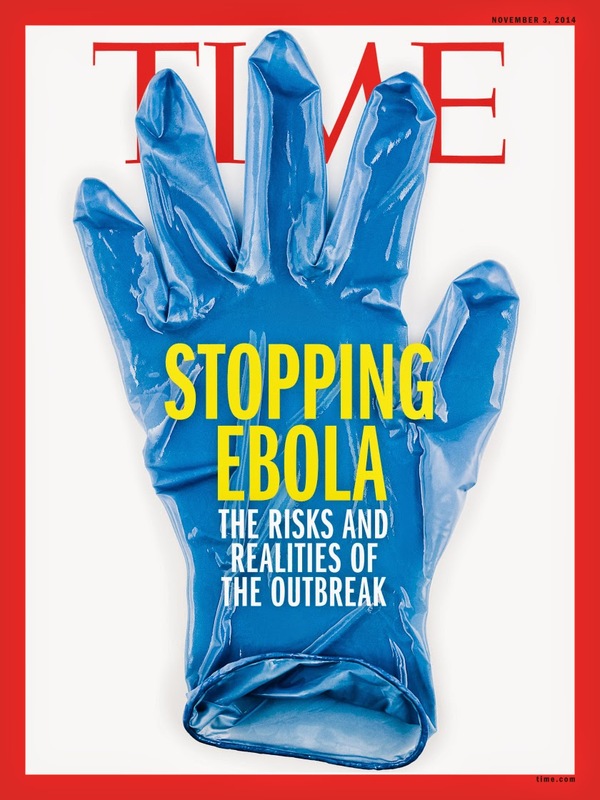 In the other editions for November 4 the lead story is “Stopping Ebola.” For some reason the editors thought that, in the U.S. at least, hating on teachers is a stronger sell than concern about the health threat of ebola (See other editions of Time — Europe, Asia and South Pacific). Randi Weingarten, the president of the American Federation of Teachers, is pushing her apology-or-boycott of Time (they apologize or we boycott). This is an effective way to rally the masses, but I doubt that it will effect the editors of Time. Chances are that they are wetting themselves with joy over the additional publicity, which, of course, was their goal to begin with. I did sign on to the apology-or-boycott, but Time Inc includes quite a few other magazines…People, Fortune, Sports Illustrated and Money, to name just a few. Do we boycott them all? My hunch is that, hidden among the print and electronic media corporations of Time Inc are some vested interests in school privatization. At the very least though, Time Inc has shown itself to be a consistent source of public school teacher bashing. They’ve been promoters of the myth of failing schools, and dealers in “reform” — starting as far back as 1980. The June 16, 1980 issue had a cover which shouted, Help! Teacher Can’t Teach. The article began by quoting Milton Friedman, the guru of privatization and vouchers. “Parents know their kids are getting a bad education” he said. Time’s cover placed the blame on teachers. Even in 1980, Time Magazine was playing the “bad teachers” card. We learned What Makes a School Great from the September 20, 2010 issue. Again, it’s “good teachers.” The lead article is a four page advertisement for Waiting for Superman. Where are the magazine covers and articles about the increase in the economic achievement gap, the increase in segregation, and the failure of the almighty charters to do any better than neighborhood public schools? Where are the covers and articles about charters skimming students from regular public schools and vouchers transferring public money into church coffers? Where are the covers and articles about the test and punish plans of No Child Left Behind and Race to the Top, which have cost us billions of tax dollars while failing to improve student achievement? Time Magazine is, quite simply, a voice for corporate reform…the November 4, 2014 issue is not an outlier. Teachers and supporters of public education should have been speaking out against this rag all along. Now is as good a time as any to start. I’ve written about why teachers quit, and about the looming teacher shortage — how schools in Indianapolis and elsewhere in Indiana started school this year without enough teachers. The teacher shortage is a nationwide problem, and it’s only going to get worse. Colleges and universities have seen a serious drop in enrollment in teacher preparation programs. Hardest hit are the nation’s largest states — California, Texas and New York. Is this what the “reformers” want? Fewer professionals in the classroom…more room for “education temps” like TFA…fewer career teachers? It’s hard not to feel paranoid when more and more state legislatures and governors’ offices are doing whatever they can to make teaching less and less attractive. Will your children and grandchildren be taught by professional educators, or by young, inexperienced, poorly trained college grads who use public classrooms as a stepping stone to a different, “real” career? Massive changes to the profession, coupled with budget woes, appear to be shaking the image of teaching as a stable, engaging career. Nationwide, enrollments in university teacher-preparation programs have fallen by about 10 percent from 2004 to 2012, according to federal estimates from the U.S. Department of Education’s postsecondary data collection. Some large states, like heavyweight California, appear to have been particularly hard hit. The Golden State lost some 22,000 teacher-prep enrollments, or 53 percent, between 2008-09 and 2012-13, according to a report its credentialing body issued earlier this month. You’re a teacher and your favorite student does poorly on an exam and, if you average that grade into his yearly total he would only get a C or a D. Do you revise your “curve” to raise his grade? Do you change the grading scale so that he’ll get an A? What would your supervisor do? How would the parents of other students in your class react? 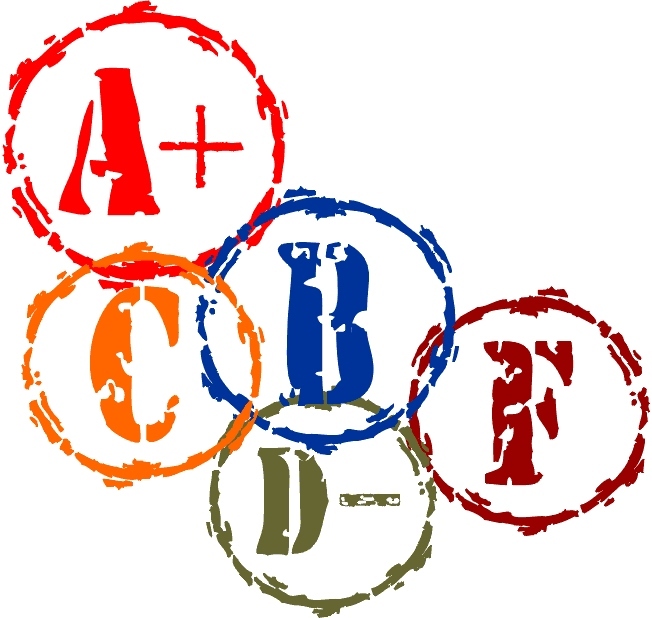 A majority of members of the Indiana State Board of Education apparently think that changing grades like that is fine as they follow in the footsteps of scandalized former Superintendent of Public Instruction Tony Bennett and manipulate the state’s A-F grading system so that their “favorite” charter school gets a higher grade. Heaven forbid that voucher and charter schools, including the Republican favorite Christel House, get low grades. In 2012 and 2014, the A-F supporters were wringing their hands over the low grades calculated for Christel House and similar schools they champion. Why? They are unequivocally convinced that the academy is exemplary, a model. Obviously, they reached that conclusion for reasons other than a state-issued letter grade. In their minds, it is an A school, regardless, and when too low a grade is assessed, they cite the ways it is “different” and round up valid reasons to dispute the C, D or F.
The 2,100 other Indiana schools could do the same thing. Year after year. Each is “different.” Parents who pick schools based on the Indiana A-to-F system are fooling themselves; those folks are better off talking with families in the district. Despite strident efforts by “The Board” to make it somehow work, its A-to-F program needs to be canceled. The Indiana Way is to suggest that a major focus of the budget-writing 2015 General Assembly will be to “fix” the state school-funding formula so that suburban and rural districts receive more funding. This “fix” comes even while school districts, particularly urban districts, and local governments reel under constitutionally imposed property tax caps that have contributed to millions of dollars in revenue loss. The Indiana Way allows for the potential of Gary Community Schools losing its transportation funding for its overwhelmingly poor students even while under state budget control. The Indiana Way is being one of two states that charge textbook rental fees, disproportionately impacting poor and low-wage households, many of which are headed by income-limited single parents and custodial grandparents. Mitchell, 74, appears to be thriving. Every year, millions of public education dollars flow through Mitchell’s chain of four nonprofit charter schools to for-profit companies he controls. Are public sector pensions the cause of the nation’s economic woes? Stephen Krashen shouts this from every podium he can find. The problem with education in the U.S.A is not poor schools or “bad teachers,” it’s high poverty. Can we improve our schools and work to recruit better teachers? Of course, but we need to do what we can to reduce the impact of poverty at the same time or our efforts will be wasted. The major problem in American education is not teaching quality, not a lack of standards or tests, but poverty: The US now ranks 34th in the world out of 35 economically developed countries in child poverty: when researchers control for the effect of poverty, US international test scores are at the top of the world, a clear demonstration that there is nothing seriously wrong with our teachers or our standards. Children of poverty do poorly in school because of the impact of poverty: Poor nutrition, poor health care, and lack of access to books, among other things. The obvious first step is to improve nutrition through school food programs, improve health care through investing more in school nurses, and improving access to books through investing in school libraries. Linda Darling-Hammond knows that Stephen Krashen is correct. She knows that other advanced nations of the world have solved their problems of poverty (while ours is getting worse) and as such, have put themselves on the road to higher achievement. Take time to listen to her presentation beginning at 59:30 in the video at the above link. “The theory of reform behind NCLB – to test and apply sanctions to the failure to meet expected targets – has not made a major difference in student achievement in every one of the areas measured by PISA,”‘ she explained. Darling-Hammond also pointed out that if you factor in only those schools where less than 10 percent of the students live in poverty, the U.S, actually ranks number one in the world on PISA. In schools where 25 percent live in poverty, the U.S ranks third. Even when you raise that number to 50 percent, our students rank way above the international average. The takeaway is clear, Darling-Hammond said. The children of Indiana are worse off since Governor Pence refused to apply for $80 million in federal funds for early childhood education. 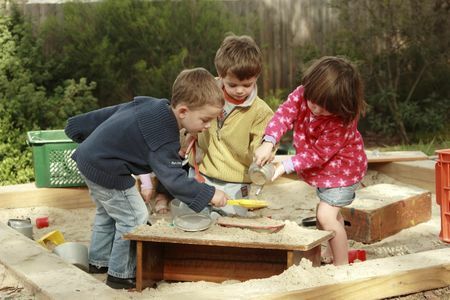 Taking steps from an early age to improve childhood education skills could raise overall population levels of academic achievement by as much as 5%, and reduce socioeconomic inequality in education by 15%, according to international research led by the University of Adelaide. In a study now published in the journal Child Development, researchers from the University of Adelaide’s School of Population Health and colleagues at the University of Bristol in the UK have modelled the likely outcomes of interventions to improve academic skills in children up to school age. They considered what effect these interventions would have on education by age 16. See also Actually, we do know if high-quality preschool benefits kids. What the research really says. The Finns give their children a 15 minute break every hour. We should learn from their example…recess matters. Two years ago the voters of Indiana elected Glenda Ritz to the office of State Superintendent of Public Instruction. Her opponent, incumbent Tony Bennett, ran on a platform of continuing reform…more vouchers, continued increase in charters, more testing, evaluating teachers using tests, weakening teachers unions, lowered standards for education professionals…and the usual “reformy”-type attacks on public schools and teachers. Glenda Ritz ran on a platform of more control by local school boards, fewer tests (including getting rid of IREAD-3), higher standards for educators, eliminating the A-F ratings for public schools, and more support for public schools/less support for privatization. The voters of Indiana have a chance to finish the job they started when they voted for Glenda Ritz in 2012. 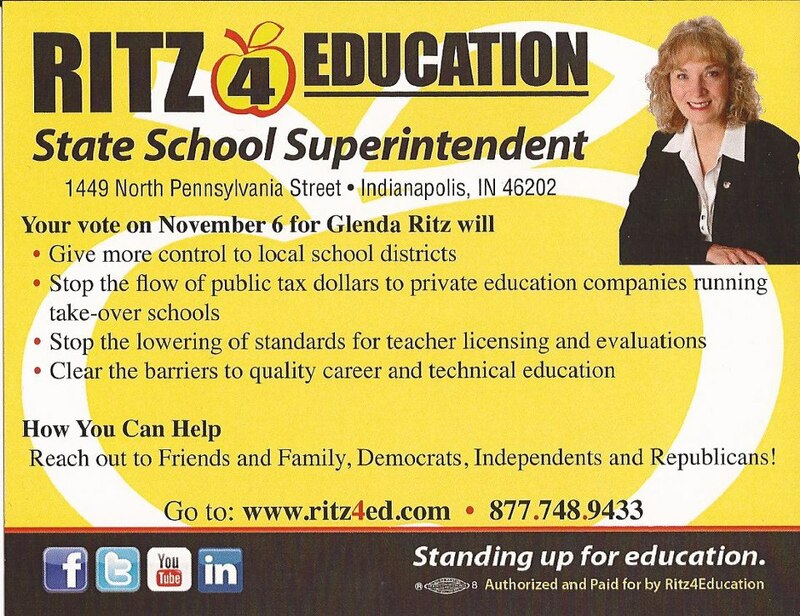 Elect friends of public education to the state legislature and help Glenda Ritz do the job we elected her to do. Choose to support your local public schools. Arne Duncan never taught in a public school. He never attended public schools. He doesn’t know what it is like to be a teacher in a public school…and he knows nothing about teaching. How is it that this man is dictating to all the state departments of education how the public schools in their states should be run? …most leaders in the reform movement have never taught a five-period day, felt the joy of an unquantifiable classroom victory, lost instructional time to a standardized test, or been evaluated by a computer. And unlike the vulnerable students targeted by so much reform, most policy elites have not gone to school hungry, struggled to understand standard English, battled low expectations, or feared for their personal safety on the walk home. 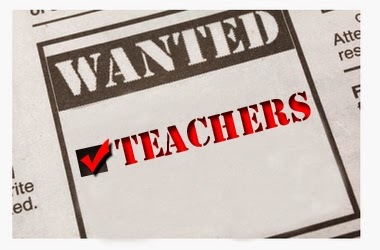 Stephen Krashen’s article, The teacher shortage and how we treat teachers, hits the nail on the head when he gives explains why there’s a teacher shortage. 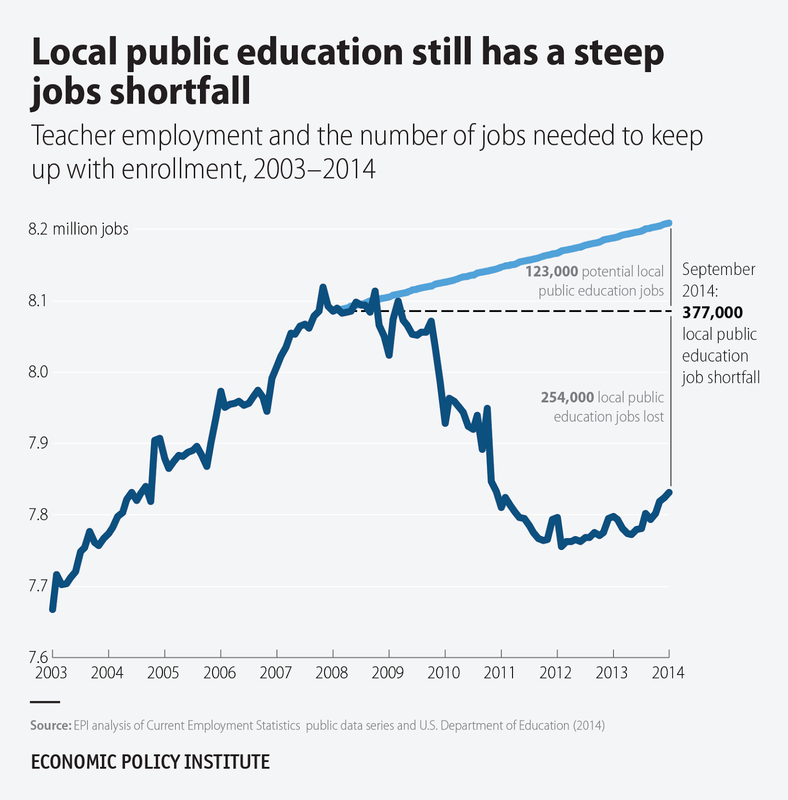 The Economic Policy Institute reports that there is a shortage of teachers because of “public education jobs lost” and an increase in school enrollment. At the same time, schools seem to be doing everything possible to get teachers to quit: removal of due-process, lack of seniority pay, the conversion of schools into test-prep centers, developmentally inappropriate and rigid standards, and the ongoing war on teachers in the media, including constant (and unjustified) proclamations about how bad American schools are because of mediocre teaching. …the number of teachers and related education staffers fell dramatically in the recession and has failed to get anywhere near its pre-recession level, let alone the level that would be required to keep up with the expanding student population. How many “reformers” actually know what it’s like being a teacher? 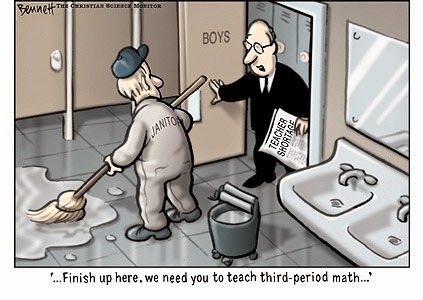 How many “reformers” have any idea of the reality of a classroom from a teacher’s perspective? But her students help put things in perspective. Throughout her years teaching, she has helped students deal with homelessness or having a parent incarcerated. She has spent hundreds of dollars of her own money on school supplies and clothing for kids in need and has spent dozens of hours translating documents and letters into Spanish for students’ families who know little English. 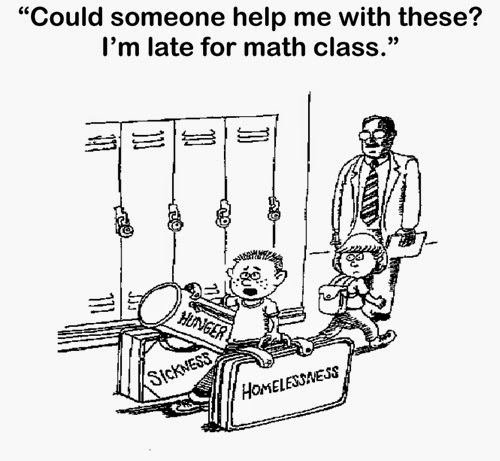 Homeless children comprise one of the fastest growing demographics in America’s public schools. We know that poverty has a negative effect on student achievement, and homeless students, like other students who live in poverty, have lower achievement levels and a higher dropout rate than children from middle class families. Politicians and policy makers can’t solve the problem of homelessness, hunger, and poverty. They dump it on the public schools, and then blame teachers, schools, and students, when the problems don’t go away. According to recently released data from the U.S. Department of Education, 1,258,182 students enrolled in public schools across the country were homeless in 2012-13. Of those, 75,940 were unaccompanied youths living on their own; 200,950 had disabilities. The total number of homeless students rose 8 percent from the previous school year and by nearly 500,000 since the 2007-08 school year, when there were 795,054 homeless students. What’s should a school be? What is the purpose of school? How do you define your life? Is it by your career alone, or is that just one aspect of who you are? Aren’t you also a friend, a consumer, a voter, and a family member? Is there more to education than just learning a trade or getting ready for a career? In Philadelphia, education reformers got everything they wanted. Look where the city’s schools are now. …the basic structure of school financing in Philadelphia is rigged to benefit these privately managed companies. Public-school money follows students when they move to charter schools, but the public schools’ costs do not fall by the same amount. For example, if 100 students leave a district-run school at a cost of $8,596 per head (the district’s per-pupil expenditure minus certain administrative costs), that school’s cost for paying teachers, staff and building expenses doesn’t actually decline by that amount. It has been estimated that partly because of these costs, each student who enrolls in a charter school costs the district as much as $7,000. There are outright subsidies too, including a loophole that provides charters with an extra “double-dip” pension payment. Charters also appear to game the state’s special-education payment system to secure a larger share of district funds. In 2013, according to the Philadelphia Public School Notebook, city charters obtained nearly $100 million more than they spent on special education. An excellent survey of corporate reform…excerpted from Losing Our Way: An Intimate Portrait of a Troubled America by Bob Herbert. …if there is one broad approach (in addition to the importance of testing) that the corporate-style reformers and privatization advocates have united around, it’s the efficacy of charter schools. Charter schools were supposed to prove beyond a doubt that poverty didn’t matter, that all you had to do was free up schools from the rigidities of the traditional public system and the kids would flourish, no matter how poor they were or how chaotic their home environments. Corporate leaders, hedge fund managers and foundations with fabulous sums of money at their disposal lined up in support of charter schools, and politicians were quick to follow. They argued that charters would not only boost test scores and close achievement gaps but also make headway on the vexing problem of racial isolation in schools. None of it was true. Charters never came close to living up to the hype. This would never happen if the children attending these schools were white and middle class. This is racism, and economic bigotry. I think that the school board’s offices — and maybe that of the mayor as well, ought to be housed in the lowest performing public school in their district. 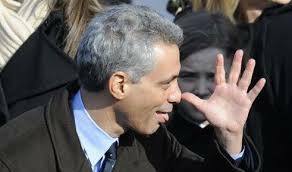 Things would clean up fairly quickly if Rahm and his rubber stamps on the CPS Board had to make it through the day wading through cockroaches and without any toilet paper. Shame. The Chicago Public School system has faced notorious budget cuts in recent years, and closed 49 schools in 2013. Recent money-saving moves to privatize management of custodial and cafeteria services have drawn the ire of parents and faculty, who have alleged schools are dirtier — and school lunches are worse — than ever. The teacher said his classroom has had a leaky ceiling that’s gone unfixed for two years, and roaches were recently spotted in a student locker room, causing students to avoid using the showers after phys ed class. …negative accounts of K12 student outcomes led to the filing of at least one investor lawsuit against the company claiming that K12 intentionally misled investors about its academic quality when then-CEO Packard claimed, during an investor call, that test results at Agora were “significantly higher than a typical school on state administered tests for growth.” In fact, the most recent data on Agora students at that time showed them testing unfavorably compared to students statewide. Was the ‘original bargain’ with charter schools a raw deal? Charter school owners don’t want oversight…they want public tax money, but none of the public responsibility that accompanies it. 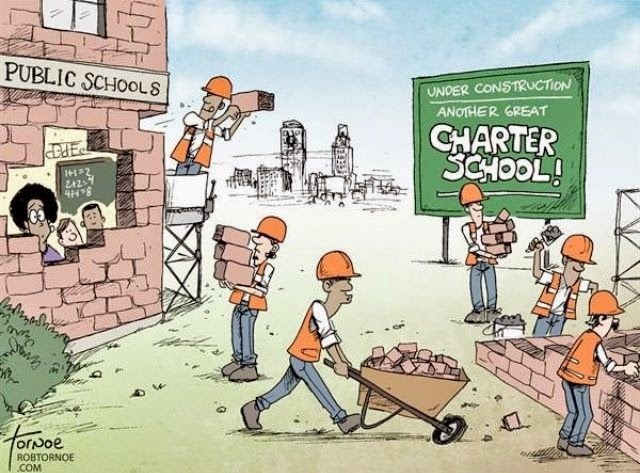 Charter school advocates didn’t like it recently when Brown University’s Annenberg Institute for School Reform issued a report calling for the strengthening of charter oversight and authorization. While noting that many charters work hard to “meet the needs of their students,” the report said that “the lack of effective oversight means too many cases of fraud and abuse, too little attention to equity, and no guarantee of academic innovation or excellence.” It provided some common-sense recommendations, including an innocuous call for the establishment of minimum qualifications for charter school treasurers. The National Alliance for Public Charter Schools, not surprisingly, bashed the report. Severe teacher shortages are cropping up around the nation — in Oklahoma, Arizona, Nevada (and Nevada), California and elsewhere. There isn’t just one reason for the growing teacher shortages…but at least one reason is present in most locations — so-called education “Reform” is making it harder to be a career teacher. Indiana is one of those states following a path which seems guaranteed to increase teacher shortages, especially in hard to teach subjects (like special education) and areas (like urban schools). The state has hit teachers, schools and districts with the overuse and misuse of student test scores, the removal of due process, reduction of collective bargaining, loss of revenue which has been transferred to charter schools and voucher accepting private and parochial schools, and pension changes. The goals seem to be, to weaken teachers unions in the state, deprofessionalize the field of education, and privatize public education. On the other hand, if you read what is posted on the Education Round Table web site (within the State of Indiana site) you’ll get a different picture. The Roundtable is charged with improving “educational opportunity and achievement for all Hoosier students.” Here’s what they say about the quality of Indiana teachers. Although the state produces a steady stream of new teachers, Indiana schools continue to experience a shortage of qualified teachers in specific content areas and specific schools. Special education constitutes over 80 percent of the shortage, followed by shortages in mathematics and science. Consistent with national trends, the percentage of teachers without full certification is highest in high-poverty districts in the state. 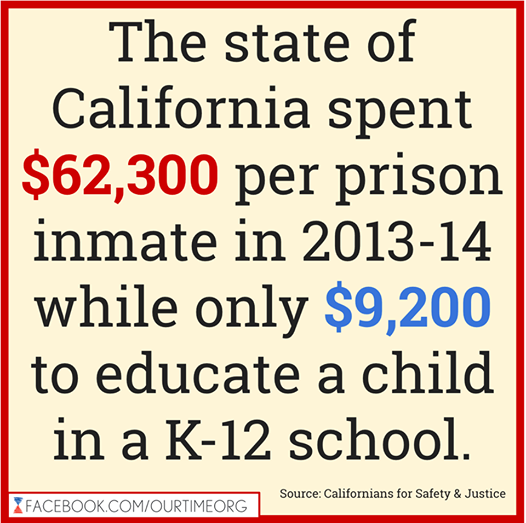 How does that stack up against what has actually happened due to the activities of the state legislature and state policy makers? It doesn’t. The words of the Education Round Table and the actions of the legislature and policy makers are at odds. So, while the Round Table touts the high quality of teachers in the state, the policy makers are making things more difficult for those teachers to do their jobs. In order to improve student achievement we need to make sure that all new teachers are well trained in pedagogy as well as content areas. The lip-service given to “fully licensed” teachers is just so much bull. Connect the dots. When we make teaching a less attractive career we lose high quality teachers and teacher candidates. Then, in order to fill classroom teaching positions, we lower the requirements for those entering the teaching profession. How does this improve student achievement? We’re doing it wrong…and we’re making it worse. Grit and determination, and the best teaching in the world has little effect when students are hungry, ill because of lack of health care, and have low levels of literacy because of lack of access to books. Pennsylvania is a perfect example of where privatization is taking us…high quality, well funded schools for the wealthy and underfunded schools for those with greater needs. It’s what scholars have bluntly called an apartheid system: wealthy districts spend more on wealthy students, and poor districts struggle to spend less on the poor students who need the most. According to state data from 2012–13, Philadelphia spent $13,077 per pupil, while Abington spent $15,148—on students in much less need of intensive services and support. Wealthy Lower Merion spent $22,962 per pupil. Kaarin Leuck, who wrote a letter titled Kids need in-school advocates for the Fort Wayne Journal Gazette, blames schools for kids’ failures. At the end of her letter she blames teachers for not teaching all children. If you are going to choose to be a public school teacher, you should teach all of the children assigned to your classroom. Step up to the plate, learn creative solutions, and help us get these kids through. not providing adequate funding for programs designed to meet the needs of hard to educate students. Instead she, like so many others, blames the people who spend their days with children trying to deal with the serious problems they bring into the classroom while simultaneously being required by the state to do the impossible, with inadequate resources, for too many children. Can schools improve? Certainly, but they need the tools to operate. Those tools and the trained professionals who use them, cost money. The Indiana General Assembly with direction and support from the governor have chosen to fund more and more charter schools and the nation’s most expansive voucher program to the detriment of traditional public school funding. Do you want good schools in Indiana and across the nation? Then we’ll have to decide that education is a priority and redirect the money from corporate pockets back into the classroom. Lily Eskelsen Garcia, NEA’s new president, bluntly reminds us that politicians and policy makers are the ones who have neglected the nation’s poverty issue, not educators. If you see all the needs of public schools — high class sizes, books, technology — all of the things we need, and you have no intention of funding those, wouldn’t it be nice to distract people by going, “Look over here, bad teacher, bad teacher, bad teacher, look over here!” Because if you can say “if we just had better teachers the roof wouldn’t leak, if we just had better teachers those kids wouldn’t come to school hungry,” it gives you an excuse to not do anything for that community, or for what that school needs. In Indiana, not only do we call children failures if they aren’t reading fluently by the end of third grade, but we refuse to let them move to the next grade. We punish 8 and 9 year olds because they…grew up in a literacy poor environment, are learning disabled, are living with the influences of poverty interfering with their learning, are uninterested in reading, have experienced trauma, or are the survivor of some other problem which prevents them from learning to read according to the state’s timetable. In Finland, the land school reformers love to praise but never emulate, they introduce children to formal reading when they are in 3rd grade. In 3rd grade our country calls children failures if they are not reading fluently. Children across Indiana will take a new, and very different, ISTEP in less than six months but teachers have only recently gotten to look at sample questions to guide them in preparing their students. NCLB is a pathetic hoax that was intended to label almost every school in the nation a failing school. The Indiana State Board of Education, over the objections of Glenda Ritz and two other members, passed REPA III, the rules which define who can and cannot teach in the state. The new rules have a provision allowing anyone with a degree to teach in high school without any pedagogical training. In Indiana we lower standards for entrance into the teaching profession and we make it hard for good teachers to do what they have been trained to do by stripping them of due process, underfunding traditional public schools, inundating the classroom with testing, and incentivizing teaching to the test. The verbiage about wanting a great teacher in every classroom is just so much disingenuous bunk! She leans on co-workers for support. I know this burnout is a common issue among very good teachers. This is what worries me. There are amazing teachers, young and old, veterans and rookies, who are starting to eye the exit door. These teachers feel overworked, underpaid, undervalued, deflated, and emotionally and physically exhausted. 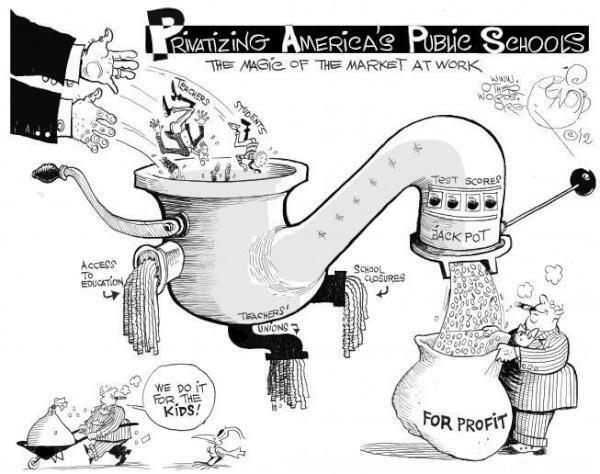 The Center For Education Reform, funded by the pro-voucher Walton Family, gives Indiana’s voucher program an -A- because it transfers a huge amount of public funding from public schools to private and parochial schools. There is one things wrong with it, though…the state requires that the private schools be accountable for their money…just like public schools. However, CER’s remarks were not all positive for Indiana: “The state is the second-worst in the country on infringing on private school autonomy, mandating such things as course content and insisting on allowing government observation of classes,” the report says.